In my opinion, you cannot get more Southern summer than a good peach cobbler. If you are from anywhere in the south, especially Texas, I’m sure you have some good memories that involve peach cobbler and your family. Any that come to mind? One of my mom’s special desserts was a peach cobbler. Admittedly, I am not a big peach fan, nor have I ever been. But when you combine fruit with a cakelike dish, I’m sold. Top it off with some homemade vanilla Ice Cream and we’re cooking with fire. The aroma of it wafting through the house as it comes out of the oven is enough to draw anyone’s attention into the kitchen. Peaches are a plenty here in Texas and my Mother In Law gave us a few from an orchard about an hour outside of town. I knew exactly what I wanted to do with them. 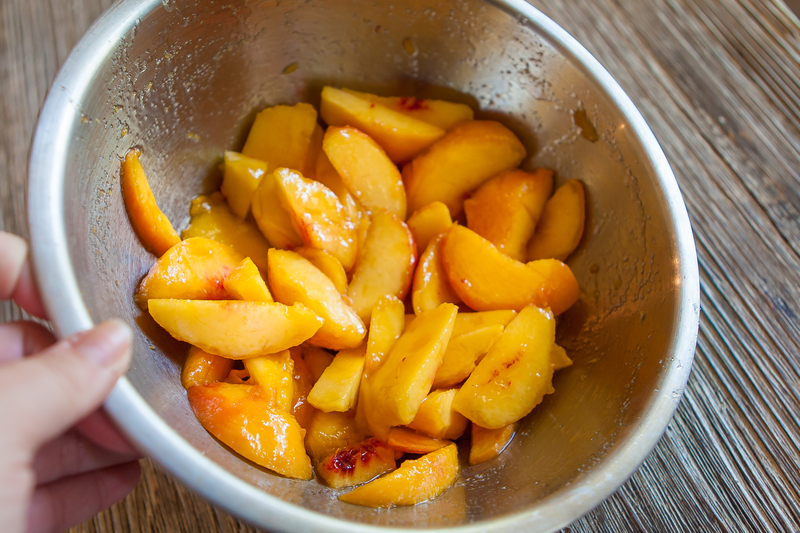 Freshly picked peaches are so juicy and sweet, they are absolutely perfect for peach cobbler. To me, the best part about peach cobbler is a crunchy crust on top and the gooey sweetness of the filling, but mainly the crust. The crunchier and sweeter the better if you ask me. I love the combination of textures in each bite when you have a crust that has some crunch. Which is why I decided to up the anti on plain peach cobbler and brûlée it. It’s been a while since I was able to use my kitchen torch, and I was hankering to do so. Don’t worry though, much like Creme Brûlée, you don’t have to own a kitchen torch to make this. Just a oven set to broil does the trick! Side note, I was really unsure if I could call this a Brûlée since you’re used to see it next to the popular french dessert, but I went ahead and did so. Even if it means I’m breaking all of the rules of recipe naming. One of the most important parts of this recipe is macerating the peaches. It really ups the sweet flavor in the dish. Don’t skip it! Also, In case you didn’t have this handy dandy trick for peeling the skin off of peaches, this is what I do. It saves time and frustration. Once that part was done and the peaches were macerated, Kirkley was able to step in and help. It is really adorable how much she loves being in the kitchen with me. I always try and bake once a week a recipe where she can spend some time with me “making”. I know I’ve said it before, but baking and cooking is a great educational tool as well! Not to mention the sweet bonding time. Please get those kiddos in the kitchen with you if you can and they are willing! 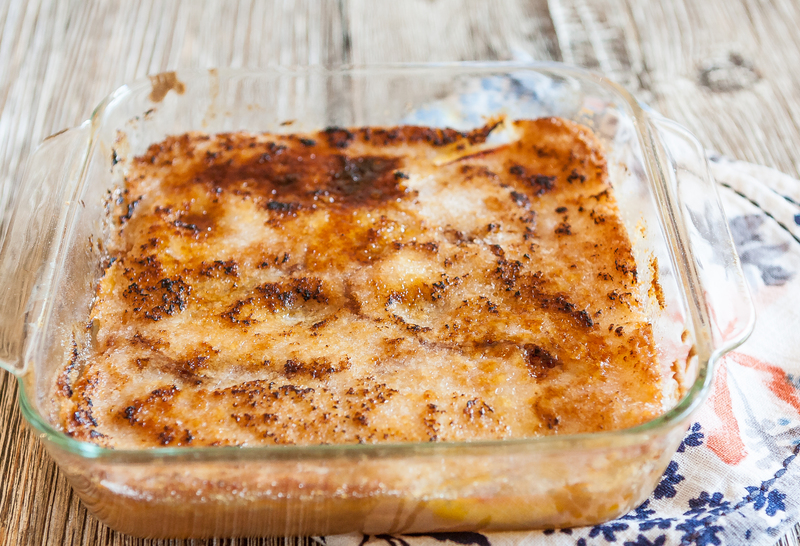 Now I think I’ve jumped all over the place in this post, but the most important thing to take away from this – This IS the best Peach Cobbler Recipe you will ever make. I’m not lying. If you like the crunch on top, and sweet gooey in the middle, you will love this. Oh, and I cannot believe I forgot to mention how the burnt sugar coating on top takes the flavor to a whole other level of amazing. Do yourself a favor and give it a shot! I hope you enjoy it as much as we did! Now that it’s gone, I’m already craving it again. Separate the sugar into: (2) 1/4 cup and (2) 3/4 cup measurements and set aside. Slice the peaches and place in a large bowl. Sprinkle 1/4 cup sugar, juice of 1/2 a lemon and 1/2 teaspoon of cinnamon. Stir well to ensure peaches are coated and cinnamon is evenly distributed and set aside covered for 20 minutes. In an 8x8 square glass dish, pour melted butter to cover the bottom of the dish. In a separate bowl, whisk together flour, 3/4 cup of sugar, baking powder and heavy cream until well combined. Mixture will be dense. Put spoonfuls of the flour mixture in the baking dish over the melted butter and gently spread until evenly distributed. In a small bowl mix 1/2 teaspoon cinnamon and remaining 3/4 cup sugar. Sprinkle sugar mixture on top of the peaches. Bake in oven for 30-40 minutes or until the crust is golden brown. Remove from oven. Turn oven to Broil setting if not using a kitchen torch. In another small bowl mix together remaining 1/4 cup granulated sugar and 1/4 cup brown sugar. Gently sprinkle spoonfuls of sugar mixture over the top of the crust to coat lightly. If using a kitchen torch, place the flame to touch the crust until the sugar browns and melts to form a crust. If using the oven broiler, place back in oven on the top rack and watch VERY carefully until sugar browns and crystallizes until desired level of "burnt sugar". (I prefer mine to have a little black). It will cook quickly, so do not take your eye off of it. Once done remove from the oven and serve immediately with vanilla ice cream or whipped cream. Leftovers can be refrigerated covered tightly for up to 3 days. Peaches are so delicious right now and your recipe looks delicious. Pinning for later. I’m from Texas, so you can only imagine how many peach cobblers I’ve consumed in my lifetime thus far, but I have yet to eat one that was bruleed. I love that idea!! All I can think of is…have you tried The Homesick Texans restaurant there? I hear she has one and it’s fantastic! I live in Kerrville and have some Fredericksburg peaches I bought a few days ago. I can’t stop eating them plain because they’re so incredible. Time to buy more to make this!!!!! Kathy – too funny! I grew up in Bandera, I know right where you are. I miss the hill country! 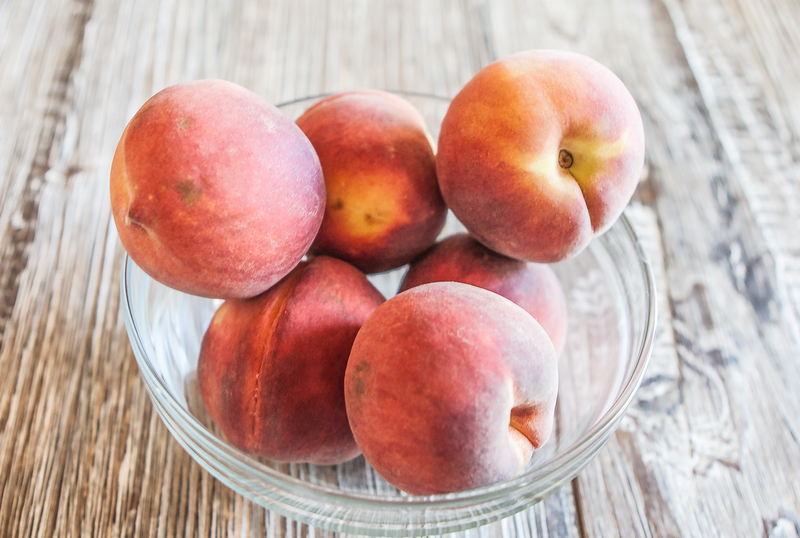 I have a big bowl of peaches sitting on my counter waiting to be used…this is perfect! 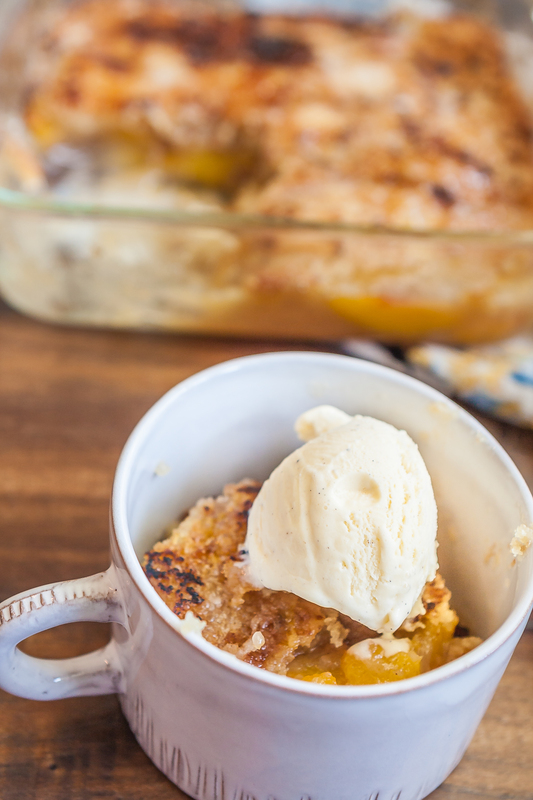 What a way to take peach cobbler to the next level! Incredible. I love the idea of mashing two desserts together to create this! I now know what I am making with my leftover peaches we picked last weekend! I love brulee and with peaches- how delicious! No better time than summer to make this! This looks SO GOOD! A crunchy top and gooey creamy peach center… Nothing can go wrong! I really would love to dig in right now! YUM! I love this! I love Peaches… and it’s plentiful these days too! 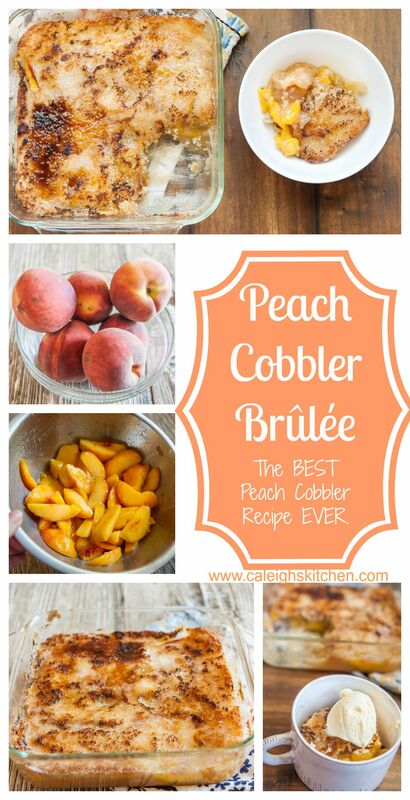 I’ve always loved Peach cobbler too but the idea of having a brulee top? That’s awesome! 😀 definitely going to try this! That crunchy topping!!! I want this now! Looks wonderful! I love fresh peaches!